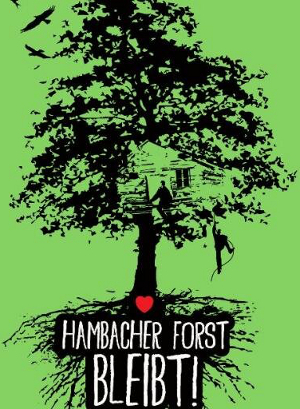 Florian and another activist, whose name is not yet published, were arrested on the 22nd of October by RWE security guards in the Hambach Forest, what actually happened there is still unclear. But one of the persons’ nose got broken and they are missing several teeth, also they were refused to see a doctor. We want to make people aware of this freakin’ brutality! We hereby invite everyone to participate in a solidarity demonstration in front of the prison in Köln-Ossendorf, on Friday, the 6th of November, at 4 PM. Furthermore, we call out for all persons who feel connected to our struggle for solidarity actions. Do actions in your city – prisons, buildings of RWE or other energy companies, German embassies… There are many targets! This is not „only“ about the protection of one of the oldest forests in Europe. Brown coal is the most inefficient energy­ carrier, and the biggest CO2 source in Europe. This massively supports climate change which has driven thousands of people from their homes and will continue to do that. We are sick and tired of people getting abused, and put into cages, just for fighting for a world that is a little bit less fucked. We need to stand up against companies like RWE that inflicts so much violence on human and non­-human animals and of course the planet. We need to stand up against a system that protects the exploiters and beat the exploited. This struggle concerns everybody! Not only those who are imprisoned, hurt and beaten up by companies or police. We are not intimidated, and hope you are not either. Inform yourself and others, come to the demonstrations or organize yourself, the options are unlimited and time is running out.